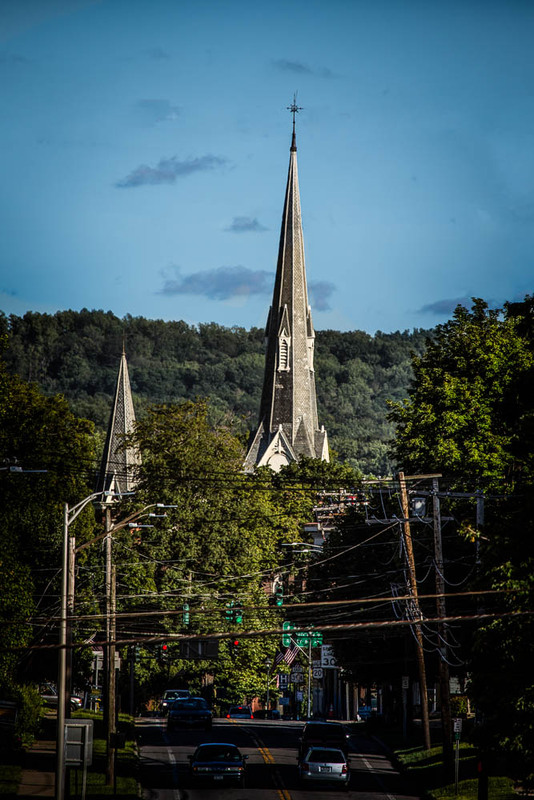 Photograph looking south on North Portage St, Westfield, N.Y. . Presbyterian Church Steeple, Westfield N.Y. This image was taken on July 24th with a Canon 5D mark lll and a Canon 100-400mm L lens from the side of the road on Rt. 394 (North Portage St.) looking south towards downtown Westfield N.Y. Categories : Architecture and Real Estate Photography, Chautauqua County N.Y., Location, Tourism, Westfield N.Y.
A new series of Pano Sunsets from Barcelona Lighthouse and Harbor Westfield N.Y. Categories : Architecture and Real Estate Photography, barcelona lighthouse harbor new york, Barcelona N.Y., Chautauqua County N.Y., Commercial Location, HDRI-High Dynamic Range Images, panorama, photoshop, Tourism, Westfield N.Y. 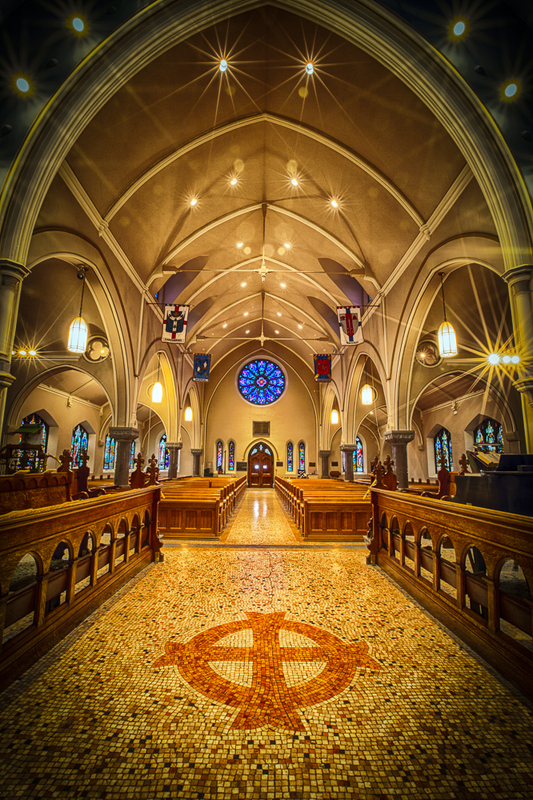 This is an interior architectural photograph of the St. Luke’s main sanctuary looking from the alter back to the main entrance. I used a 7 exposure bracket to produce this HDR image in niksoftware efexHDRpro 2, then some work in Photoshop and Lightroom to come up with the final look. Two quick shots taken on Dec 14th 2012. These are more HDR images taken at Tanglewood Manor in Jamestown N.Y. I spent maybe five minutes getting the exposure for these. The camera was set on Aperture Priority, Auto Exposure Bracket, the exposure was Normal, -1 stop and -2 stops. The day was kind of grey and lifeless, HDR was needed to force some pop out of the image. Some contrast, clarity and vibrance where added in Lightroom 4 after efex HDRpro did its thing. The total time on this shot including shooting and processing is maybe 15minutes. This HDR image is made up of 3 handheld exposures taken at Normal, -1, -2 stops and then combined in efex HDR and then taken into photoshop for some final touches. To start the process off I had to take each image into photoshop to remove elements that the HDR program couldn’t keep from ghosting when the 3 images are combined. Then the images where taken into the HDR program to let it do it’s thing, which I think does a very good job. Then like I stated above it was taken into PS5 for some fine tuning. Location of image is the memory gardens at Tanglewood Manor in Jamestown N.Y.
Have been working on a new technique in photoshop to blend a photo with a couple of other layers to give the image a painterly,drawing with a bit of the photo showing through it all. The photograph was duped in PS5 and that dupe was changed into a black and white and then duped again and some filter effects added to give it a drawing look and then blended and combined on top of the photograph layer. Then the background texture layer was brought in and moved to the bottom of the stack. 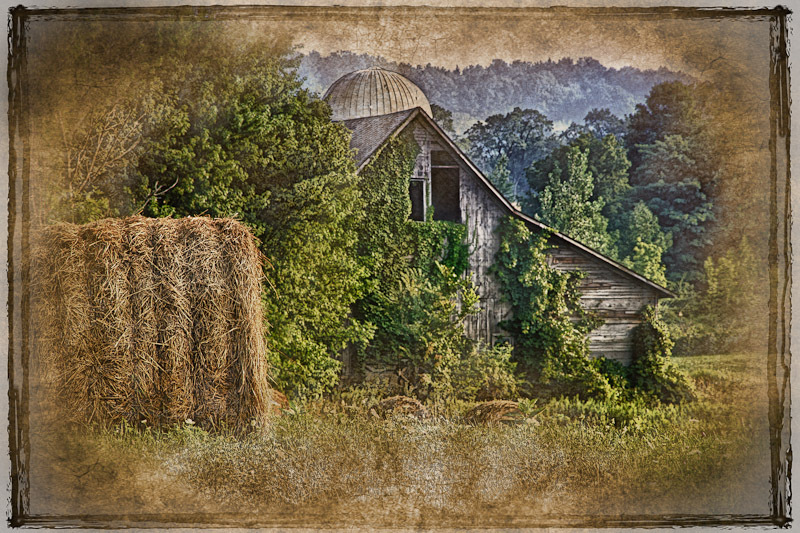 A multiply layer blend was added to the top layer and a black adjustment mask was added to the original photo layer to allow the selected blending of the whole group. 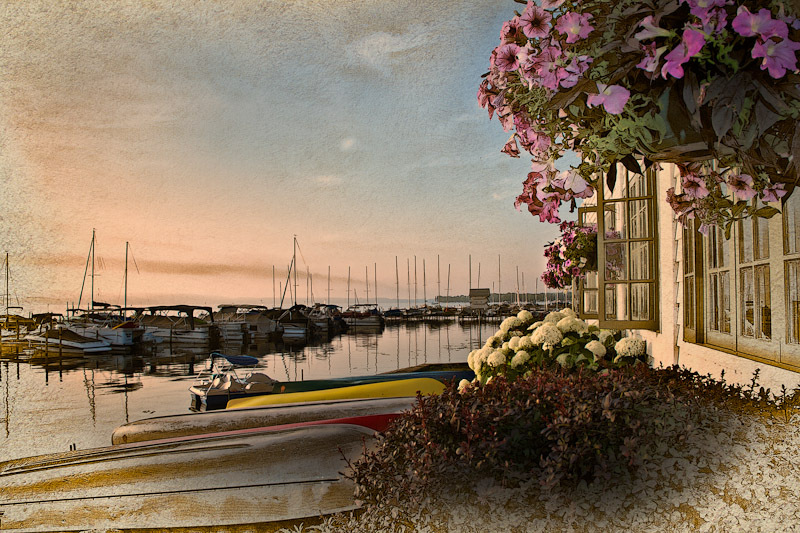 Categories : Architecture and Real Estate Photography, Chautauqua County N.Y., Chautauqua Institution, Chautauqua N.Y., Location, photoshop, Photoshop Composite, Retouching, Westfield N.Y.
Sunset over looking lake Erie – Westfield N.Y. 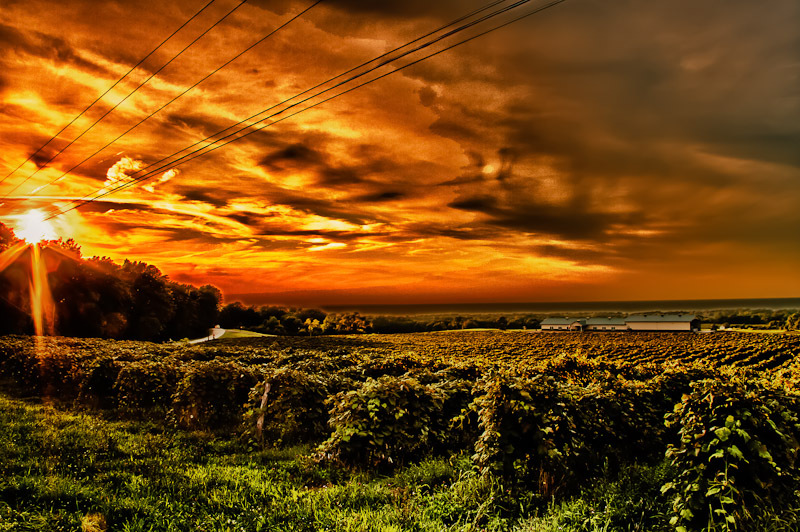 This is from the Noble Winery shot from Aug. The image is a 3 frame HDR with some dodging and burning done with the adjustment brush in Lightroom 3. Lake Erie in the background. 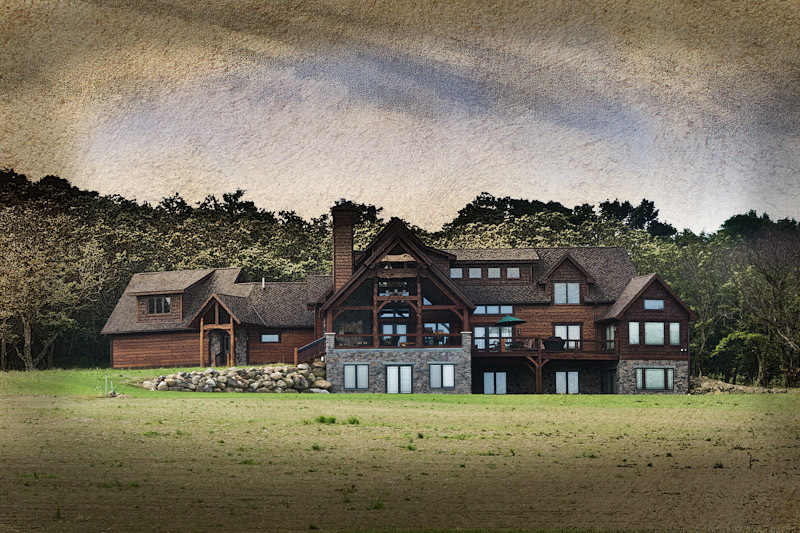 Categories : Architecture and Real Estate Photography, Chautauqua County N.Y., Commercial Location, HDRI-High Dynamic Range Images, Location, nik software HDR efex, Tourism, Westfield N.Y.